As of this writing, the 250 gigabyte capacity point represents a sweet spot at which consumers receive the most space per dollar spent. All five major SATA manufacturers offer a 250 GB model with a street price that hovers around $100. All drives in this roundup feature two or three platters and incorporate a native SATA interface running at either 1.5 or 3.0 Gb/sec (remember, however, that this figure represents a ceiling rather than achieved rates). Some manufacturers outfit their budget-oriented drives with 8 megabytes of buffer while two have doubled cache to roomier 16-megabyte standard. Currently Hitachi\'s highest-density offering; the firm\'s flagship Deskstar 7K500 uses 5 100 GB platters. Only slightly smaller than the flagship 300 GB DiamondMax 10. This family will continue to represent Maxtor sentry into the mid-capacity sector following the introduction of the high-capacity DiamondMax 11. This 250 GB offering is also Samsung\'s current flagship. Though a 400 GB successor has been announced, it is not yet readily available in the North American market. Seagate remains the only manufacturer to back its entire line with an across-the-board 5-year warranty. The 7200.9 family\'s areal density varies from 125 GB/platter to 160 GB/platter. The only drive in the roundup that still uses 83-gigabyte platters, a density that first hit the market nearly three years ago. Average Read Access Time- An average of 25,000 random read accesses of a single sector each conducted through IPEAK SPT\'s AnalyzeDisk suite. The high sample size permits a much more accurate reading than most typical benchmarks deliver and provides an excellent figure with which one may contrast the claimed access time (claimed seek time + the drive spindle speed\'s average rotational latency) provided by manufacturers. The Hitachi Deskstar T7K250 weighs in with a measured access time of 12.8 ms and continues the line\'s tradition of leading the pack in this low-level measure. 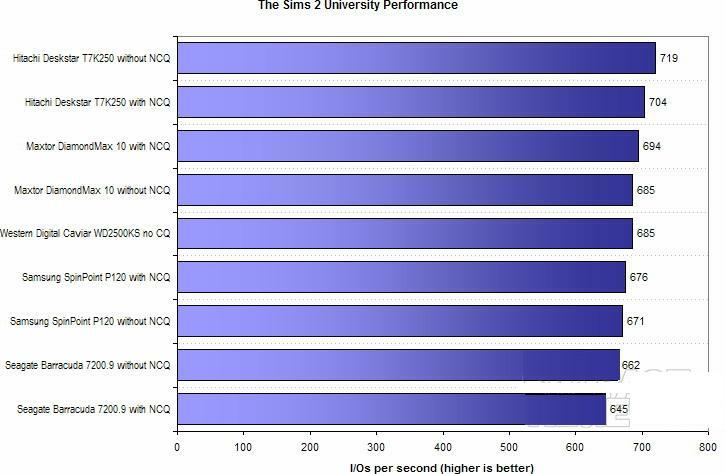 A bit more surprising, however, is the Seagate Barracuda 7200.9\'s placing at 13.3 ms. Traditionally, Seagate\'s drives have lagged somewhat in the access time department. Here, however, it appears that relieving the drive of an arm or two brings the 250-gigabyte unit in line with that of the competition. 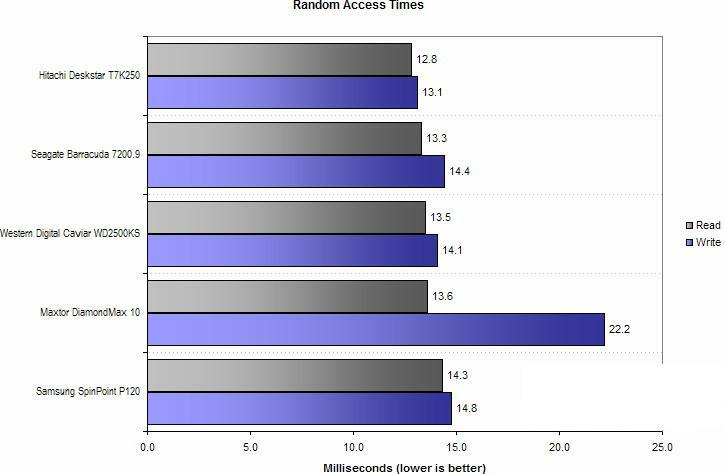 When it comes to write accesses, the Maxtor DiamondMax 10 mimics the high score turned in by the MaXLine III .Even so, its important to note that write accesses are heavily mitigated by buffering- the Maxtor\'s lagging score here should not significantly affect high-level performance. 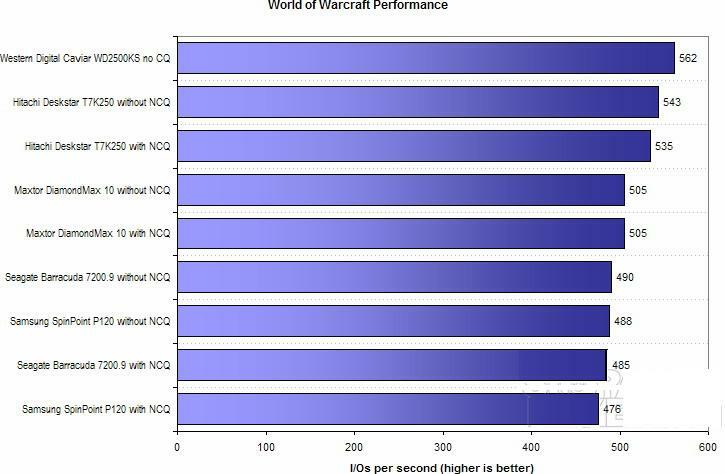 Finally, World of Warcraft represents the testbed\'s role-playing entry; it issues disk accesses when switching continents/dungeons as well as when loading new textures into Ram on the fly. The Deskstar and DiamondMax jointly lead the pack in our trace of FarCry\'s level-loading and gameplay disk access.wd carviars comes in just behind the Hitachi and Maxtor. Seagate manages to climb out of the cellar here, besting Samsung\'s SpinPoint to claim fourth place. Hitachi\'s drive manages to put just a bit of distance between itself and the Maxtor in our Sims 2 suite. WD again occupies the middle while Samsung\'s drive makes a comeback and wrests the fourth slot from the Barracuda. Now our World of Warcraft test, the Caviar claims the number one spot. Always a contender, Hitachi\'s Deskstar trails a bit. The DiamondMax lands a notch behind the leading pair with the offerings from Seagate and Samsung coming in ever so slightly behind. Unlike single-user machines (whether a desktop or workstation), servers undergo highly random, non-localized access. we simulates these multi-user loads using IOMeter. 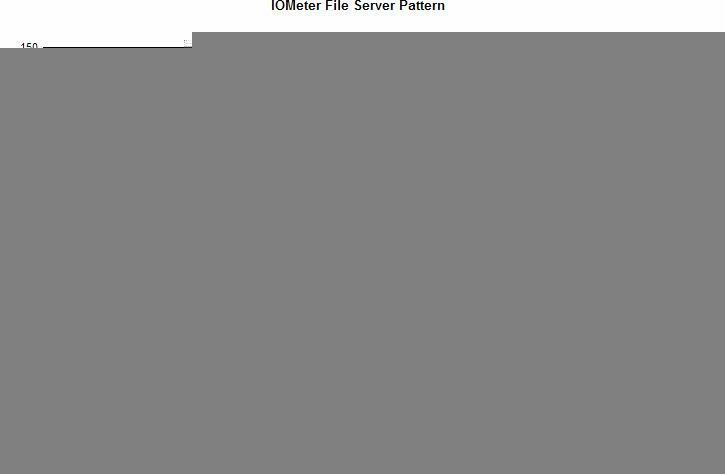 The IOMeter File Server pattern balances a majority of reads and minority of writes spanning requests of varying sizes. Drives featuring NCQ clearing outgun WD\'s offering, the sole unit in the roundup that fails to offer SATA\'s command reordering functionality. Leading the group at very high queue depths isMaxtor s DiamondMax 10... no other contender comes close when concurrency exceeds 32. Operating Power Dissipation- The power consumed by a drive when idle and when performing fully random seeks. In the relatively closed environment of a computer case, power dissipation correlates highly with drive temperature. As a drive dissipates more power, it increases a chassis\'s internal temperature by a greater amount. Startup (Peak) Power Dissipation- The maximum power dissipated a drive upon initial power-on. This figure is relevant when a system features an array of several drives. Though most controllers feature logic that can stagger the spin-up of individual drives, peak power dissipation may nonetheless be of concern in very large arrays or in cases where a staggered start is not feasible. Generally speaking, drives hit peak power draw at different times on the 5V and 12V rails. The 12V peak usually occurs in the midst of initial spin-up. The 5V rail, however, usually hits maximum upon actuator intialization. 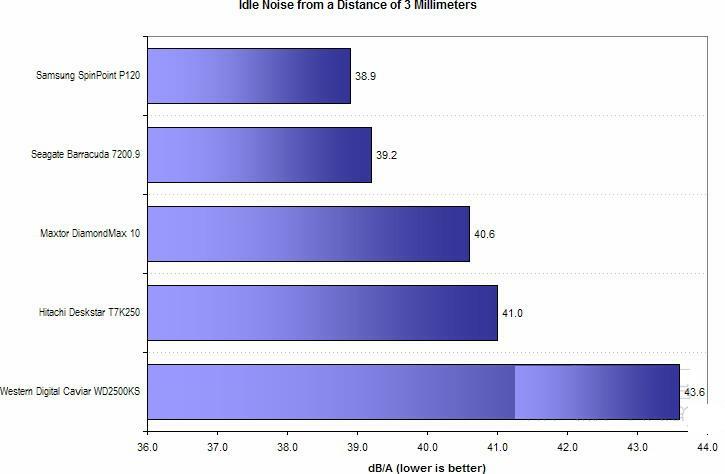 Samsung\'s SpinPoint and Seagate Barracuda offer the lowest idle noise floors of the five drives in the roundup, offering objectively-measured scores of about 39 A-weighted decibels measured from a distance of 3 millimeters. The DiamondMax and Deskstar weigh in about 1.5 to 2 decibels higher while Wd Caviar brings up the rear with a measured score significantly greater than the competition. Subjectively speaking, however, the WD2500KS\'s idle noise is hardly something worth sounding an alarm over. Its 43.6 decibels remains inaudible over most fans. Again subjectively, seek noises for the five drives are all dull and muted. The Deskstar and DiamondMax\'s noises are, perhaps, just a wee bit more substantive that the others. Despite its three-platter design, the Caviar WD2500KS leads the pack in dissipating just 9.4 watts under a full load. 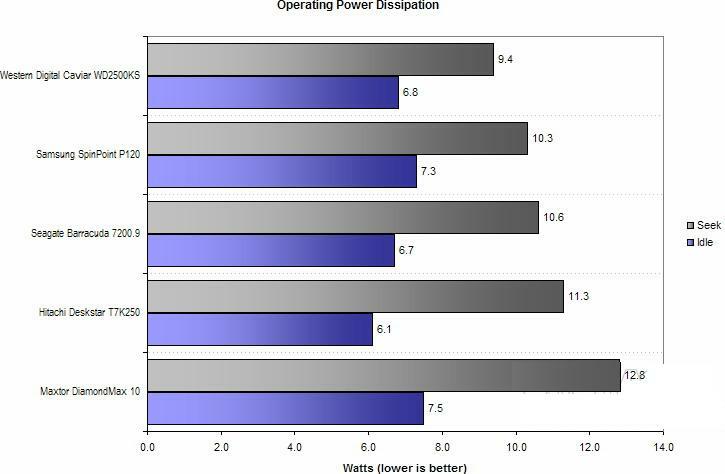 At idle, the WD\'s 6.8 watts more or less ties that of the Barracuda 7200.9 and trails only the Deskstar T7K250. The Deskstar, however, swallows up significantly more power when seeking. The SpinPoint P120 offers the second-best overall power profile, though the Barracuda makes a convincing case.Maxtos diamond 10 rests on the floor, with the highest marks in both idle and seek power draw measures. 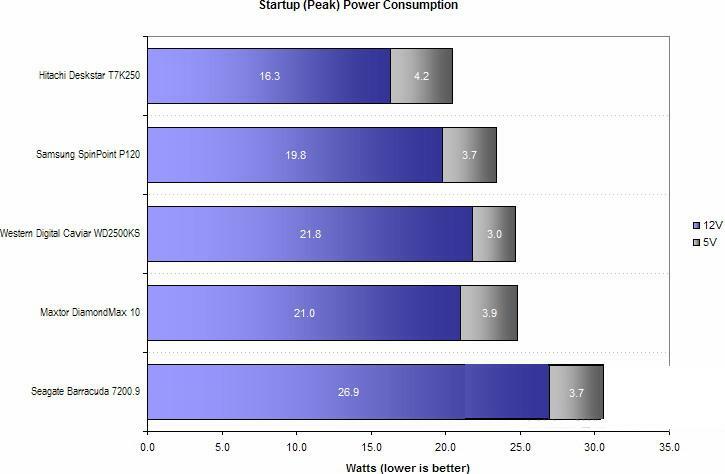 Only the Deskstar and Barracuda stand out in our peak power draw assessment. Hitachi\'s unit continues the firms category-leading tradition while the Seagate continues to draw significantly more current than other drives. Much of the data compiled for this hdd review underscores some trends already discerned by knowledgeable readers - features such as a faster 3 Gb/sec interface and Native Command Queuing do not necessarily translate into a real, measurable performance gain. Seagate Barracuda 7200.9: In its flagship 500 GB incarnation, the Barracuda 7200.9 is a middling performer at best. The loss of half its capacity and half its buffer leaves the 250-gigabyte \'Cuda a relatively poor performer. Though it offers environmental and gaming performance on par with the SpinPoint, Seagate\'s drive does not match Samsung\'s strong productivity scores. The Barracuda\'s server scores, on the other hand, lead the pack. No discussion of the 7200.9 is complete without mentioning that Seagate remains the only manufacturer to back its SATA drives with the same robust 5-year warranty that protects its SCSI line. While we do not necessarily believe that a longer warranty automatically translates into a more reliable product, it is clear that many readers do- if you are looking for peace of mind, get a Barracuda. We would be remiss without noting that, overall, performance differences between all five contenders remain relatively small. These days, 250 gigabyte SATA drives are commodities; all players have honed their offerings down to levels where distinguishing between them on the basis of performance, environmental factors, and price can be quite difficult. Absolute fastest? Hitachi. Least expensive? Maxtor. Quietest? Samsung. None of these factors matter? Choose your favorite brand. As demonstrated by drives from Hitachi, Seagate, and Western Digital, one does give up more than sheer space when moving down to a commodity 250 gigabyte drive from a capacious flagship. Also, Maxtor and Samsung both have larger units right around the corner. Keep this in mind when allocating your budget towards various components... a bit more dough gets you more capacity and more speed.